The Ray Kennedy Cup is an international football tournament for those living with Parkinson’s. The competition was founded by physiotherapist Finn Egeberg who realised the movements in football could greatly benefit those with the condition. The Ray Kennedy Cup is an annual football tournament that takes place in Copenhagen, Denmark, for those living with Parkinson’s. We caught up with organiser Eigil Sabroe to chat about this year’s event. What is the Ray Kennedy Cup all about? The Ray Kennedy Cup is an annual football tournament in Copenhagen, Denmark, where people with Parkinson’s can meet others with similar experiences. It’s a great chance to socialise, and of course play football, with other members of the Parkinson’s community. The first tournament was hosted five years ago to promote physical activity amongst those with Parkinson’s. Staying active is such an important part of treating the condition and it’s been great to see the tournament grow over the years. When we first started we only had three teams, this year we were delighted to welcome eight. What made you choose football over other sports? Football is without a doubt the most accessible sport in Denmark. Most children play from as young as five years old, and today we have many girls getting involved with the sport, which wasn’t the case before. We wanted to connect with as many people as possible so it was an easy choice. We’re lucky in that we’ve had a really positive response from other football clubs in Denmark. There is a team made up of people with prostate cancer who we have enjoyed training with. There are other sports that we are interested in – boxing is great for people living with Parkinson’s and we’re also planning on hosting a table tennis tournament. What are the tournament rules? Does it differ from other football competitions? It is more or less the same as other football tournaments, although there are a few differences. For example, we allow the goalkeeper to handle the ball outside the box. In the tournament, every team is made up of seven players and three substitutes. 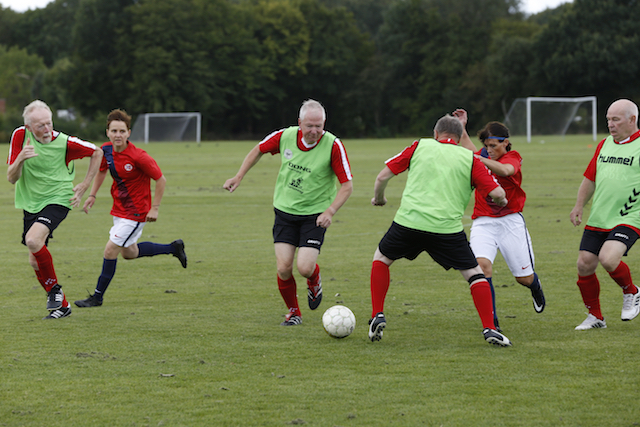 We allow each team to field one player who doesn’t have Parkinson’s, although that player must be over 60. How did this year’s event go? This year’s event was brilliant. It was great to have eight teams – all from Denmark, Sweden and Norway – take part in the tournament. The 2017 competition was also particularly special as we had our first ever female team attend. We split the teams into two groups of four, with every side playing one another. The winners of these groups then competed in a final. This year’s champions were a team from Jutland, Denmark, who were a really good side – they won all of their matches. After the tournament, all the players attended a social event and had dinner together, which was a great way to end the day. We’re already looking forward to next year when we’re hoping to have more teams attend. We’re in talks with sides from England, Scotland and Holland – hopefully we can raise some money to fund their trip to Denmark. Where does the name of the competition come from? Ray Kennedy was a well-known 1970s footballer, who played for Arsenal, Liverpool and England. Unfortunately, his career was cut short when he was diagnosed with young-onset Parkinson’s at the age of 33. With his connection to Parkinson’s, we thought he was the ideal person to name the tournament after. We’ve actually been in contact with Ray Kennedy through the people who look after him – unfortunately he hasn’t been able to attend the tournament yet. What are the biggest challenges when organising events like this? The biggest challenges we face are financial ones, as organising these tournaments costs a lot of money. This year we were lucky enough to have support from charities, and were delighted to be able to pay for all the food and accommodation for the teams taking part. Another challenge is finding volunteers to help organise the event. There are so many people who want to get involved with tournaments like this, but all too often the responsibility lies with just a few people.